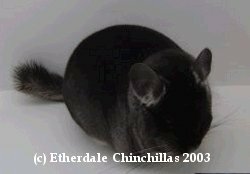 Welcome to the website for Etherdale Chinchillas, owned and run by Eddie and Richard Crutchley. We are based in the United Kingdom, near Manchester, in the North-west of England, and we have an established herd of top quality chinchillas. Site updated 15th March 2012. Please click 'refresh' on your browser toolbar to update pages. · 17 x Reserve Grand Show Champions. If you do not see a banner at the top of this page and a menu to the left, click here to be re-directed to our main site. Our ranch brand is ED, short for Etherdale, a name formed from a combination of the river and valley in which we live. For more about us and our herd, please see the 'About Us' section of this website. many UK chinchillas will have the letters ED prefacing animals in their pedigrees, and this is a testiment to the hard work and high overall quality of our herd. Our aims and objectives are to breed the best chinchillas possible in line with the guidelines set down by our national body, the National Chinchilla Society (NCS). We breed our chinchillas to be healthy, strong, with good vitality and longevity, and also to be animals of true class and beauty. 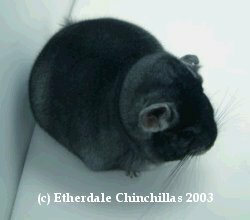 Our chinchillas are particularly noted as being clear and blue in colour, together with having plushy, silky-strong stand up fur quality. 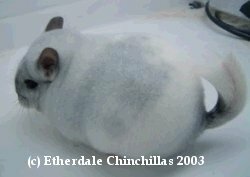 We have also managed to breed chinchillas with strong conformation (shape), often having our animals refered to as 'Brevi type' by our continental and American chinchilla friends. Chinchillas were initially imported into the United kingdom in the 1950's and 1960's for the fur industry, but we breed our chinchillas ONLY to exhibit and promote the species in its most beautiful form. The pictures on this webpage are of three successful chinchillas in the 2003/04 season. Although our interests are in breeding chinchillas with beautiful fur, we are not in any way involved with the fur industry, in line with current UK legislation. We hope you find this site useful and easy to navigate around. Any constructive comments on the content, layout and navigation of this site will be gratefully received by the webmaster.